The Patterns for e-business are a group of proven, reusable assets that can be used to increase the speed of developing and deploying e-business applications. 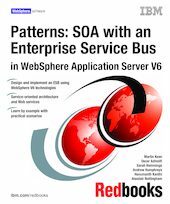 This IBM Redbooks publication focuses on how you can use the service-oriented architecture (SOA) profile of the Patterns for e-business to implement an Enterprise Service Bus in WebSphere Application Server V6. Part 1 presents a description of service-oriented architecture and the Enterprise Service Bus. Part 2 describes the business scenario used throughout this book and explains the key technologies that you can use to build an Enterprise Service Bus in WebSphere Application Server V6, including Web services and the service integration bus. Part 3 guides you through the process of architecting and implementing various Enterprise Service Bus configurations using WebSphere Application Server V6 and Rational Application Developer V6. It discusses router and broker scenarios within an Enterprise Service Bus, along with a gateway to enable interaction in an inter-enterprise environment.